Pastor and Young Activist Choose to Do the Time Instead of Pay the Fine! Lansing: Today Rev. Bill Wylie-Kellerman and Tommy Tackett turned themselves in to the 54th District Court, in Lansing, regarding the action taken on May 21st, at the Michigan Department of Human Services. They were immediately taken into custody to begin their 12 day sentence. 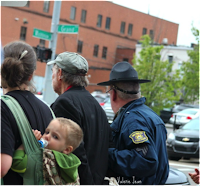 In May, as part of the Poor People’s Campaign: A National Call for Moral Revival, a group of Michigan residents blocked the doors and entered the Michigan Department of Health and Human Services. On that day legislation was pending that would have required recipients of food and health aid to work 80 hours per month, but by a clever stipulation exempting white rural counties and binding black majority ones. They stopped office business as usual to ask: Who will DHHS serve? Systemic racism? Corporate development? Neighborhood clearing? Or will it serve justice? Will it serve people, poor and Black and all? 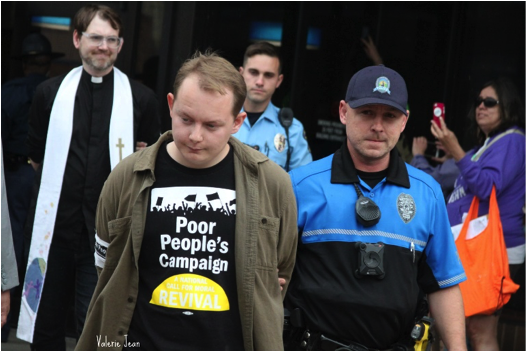 Rev Kellerman and Tommy Tackett took action to demand justice from the government that serves “We The People”, to shine a light on poverty and systemic racism and to demand that the people being most impacted be heard! During their court appearances on October 30, they pled “no contest” and were sentenced by Judge Delucca of 54 District Court to “$300 in costs and fines or 12 days in jail”. Eight activists decided to pay the fine; however, after some deliberation and prayer, this morning, Rev Kellerman and Tommy Tackett turned themselves in and will serve 12 days in jail. Minister Emeritus of St Peter’s Episcopal Church and longtime Detroiter, Rev. Bill Wylie-Kellerman gave this statement on his decision to serve jail time, “I believe that civil disobedience and non-violent direct actions have moral trajectories to them – lines which can be played out in a variety of ways. I am willing to be held accountable and to give an accounting of my actions. Whether one goes to trial or enters a plea, as we did in this case, it represents an opportunity to “go on record” with our commitments. That is also the case with my choice as a matter of conscience to do the 12 days instead of paying the fine. Facing the prospect of jail, we are mindful, as the Poor People’s Campaign stresses, that though People of Color make up 37% of the US population, they comprise 67% of prisoners in county, state and federal systems. We pray our decision about this sentence will truly be in the service of justice. A Poor People’s Campaign Moral Agenda, was drawn from this listening tour, while an audit of America conducted with allied organizations, including the Institute for Policy Studies and the Urban Institute, showed that, in many ways, we are worse off than we were in 1968. The Moral Agenda, calls for major changes to address systemic racism, poverty, ecological devastation, the war economy and our distorted moral narrative, including repeal of the 2017 federal tax law, implementation of federal and state living wage laws, universal single-payer health care, and clean water for all.